(Richmond)- The ACLU is calling for the statue of Robert E. Lee to be removed in Richmond. Yesterday was the 154th Anniversary of the Confederate general surrendering to the Union, and the ACLU used the occasion to call on Governor Ralph Northam to exercise executive authority against the statue. 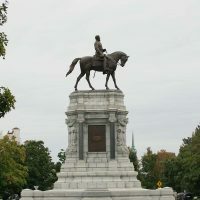 Lee’s statue was built in 1890 and stands on Monument Avenue. The ACLU says it’s a symbol of racism and oppression built during the Jim Crow era, and it needs to go.